It is very sad that lovely kids like Jacob, REAL PEOPLE with Down Syndrome, are being aborted every day – about half of the abortions in Australia, we are told, are babies with Down Syndrome – kids being denied a future in our society. When will society see that ALL kids are a blessing from God, not just the more perfect ones. That people with Down Syndrome have just as much right to heart transplants and other vital operations. Gattica aint so far away, cos its here rite now. The future for people with Down Syndrome, however, is getting better, as more and more of us stand up and say, our children with Down Syndrome must be integrated. Photo: Jacob at 1 year. At two years of age, Jacob is obviously a lovely, entertaining and happy chappy. I can honestly say, that even if the worst came to the worst and he doesn’t escape the intellectual disability of Down Syndrome and that if he chose to remain living with us as an adult, that I think Jacob would be a great joy and benefit to us. He would be a joy to grow old with. As would most people with Down Syndrome be I think. Jacob’s future in Australia – even with the Down Syndrome and any intellectual impairment, Jacob’s future may not be ideal, but it is a far cry from what it would have been even a few years back. We anticpate people with Down Syndrome will marry in the future. 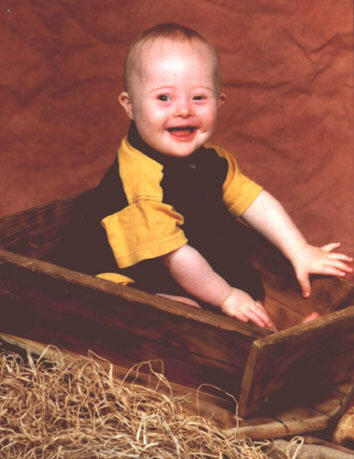 His generation will be the first to out live the parents – expectation for people with Down Syndrome is normal age for death.Alzheimer’s is possibly a myth for people with Down Syndrome , the incidence may well become the same as everyone else – though fish/fish oil, B12 and folic acid may reduce the incidence below expected normal levels for people with Down Syndrome . He and other people with Down Syndrome will have a choice in how to be schooled and many people with Down Syndrome, including Jacob, are now in normal school. Jacob and other people with Down Syndrome have a future where they will learn to speak well, learn to read, write, do maths, handle money, exercise self protective skills and live independently, for the most part. People with Down Syndrome, including Jacob, now and in the future, will have work prospects. if intelligence is down, there are still job prospects – apparently people with Down Syndrome are cherished workers because they have been seen to put all their effort into the work, have much fewer sick days and are happy in the job – eg, working in fast food places ( when we visited Hamilton recently, we stopped at MacDonalds for some fast food and found a young lady with Down Syndrome working there), salvage yards, gardening… Jacob and other’s with Down Syndrome will be able to have vacations and go visit distant places with other people – people with Down Syndrome tend to travel in their own groups with a supervisor. The day care centre and we, his family, have provided him with excellent social skills and development opportunities, that will help him through out his whole future life. Yes, there may be times in the future when he may need a bit more support than other people, but there will be people he can call on for that help. So his future and the future of others looks much brighter, happier and much more normal, than what it would have been in the bad old days.